Been having some shifting trouble with my QingQi QM200GY. Regardless of what I do with clutch lever adjustment, it feels like the clutch is always engaged. If the bike is running, it's almost impossible to get into neutral. Turn it off, and all the gears seem to be fine. After tearing it down, fiddling, and putting it back together nine times , I think I got it sorted. If your clutch is slipping, you probably have worn out plates. You can get a set of new plates and springs, problem solved (usually). 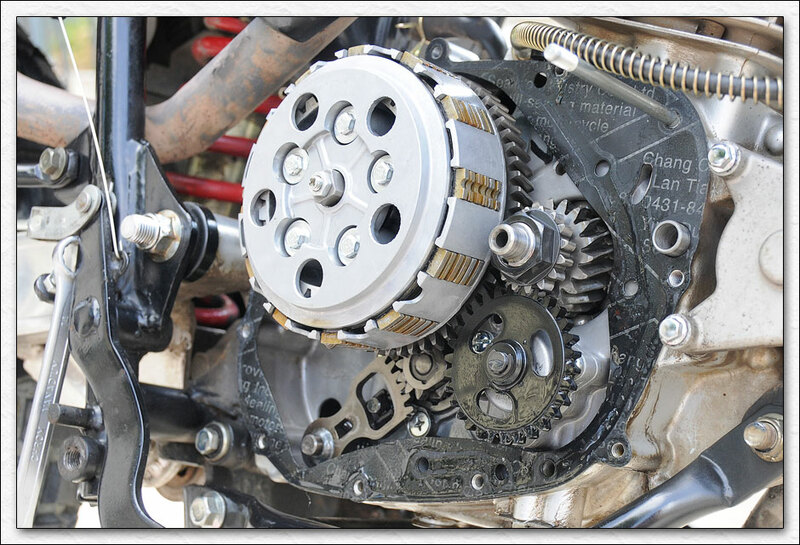 If you remove the entire clutch assembly from the bike and still can't get it to shift, you could have transmission problems. I would check the pawls on the gear shifting cam and beyond that it's dropping the engine and splitting the cases. The transmission of my bike seemed fine when I had it torn down so I looked elsewhere. 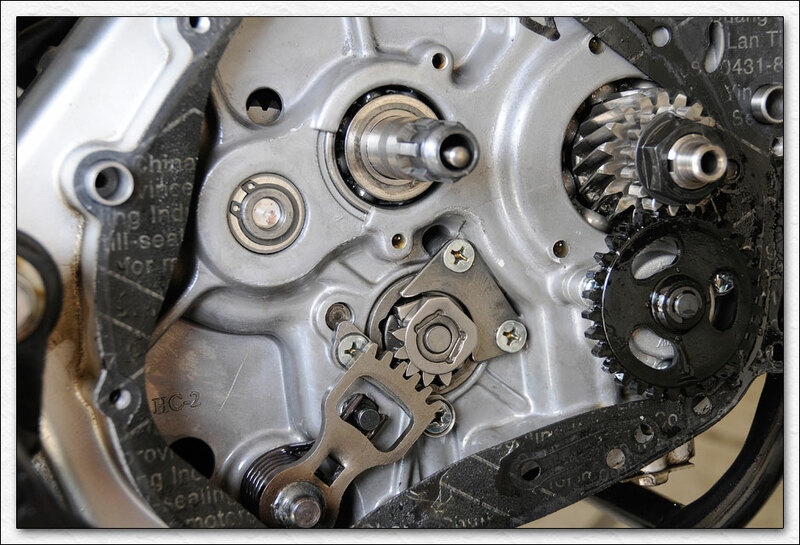 If your bike creeps forward in gear with the clutch pulled in, or is extremely difficult to get into neutral with the engine running, replacing the following parts may help. Let's have a look at the clutch diagram and the parts I ordered (shown in red). #2 Washer (replaced because it looked worn). #5 Lock Washer (replaced because I bent it too many times). #6 Washer (replaced because it looked worn). #12 Clutch Push Rod (replaced because I had a bad feeling. New one was about 2mm longer). 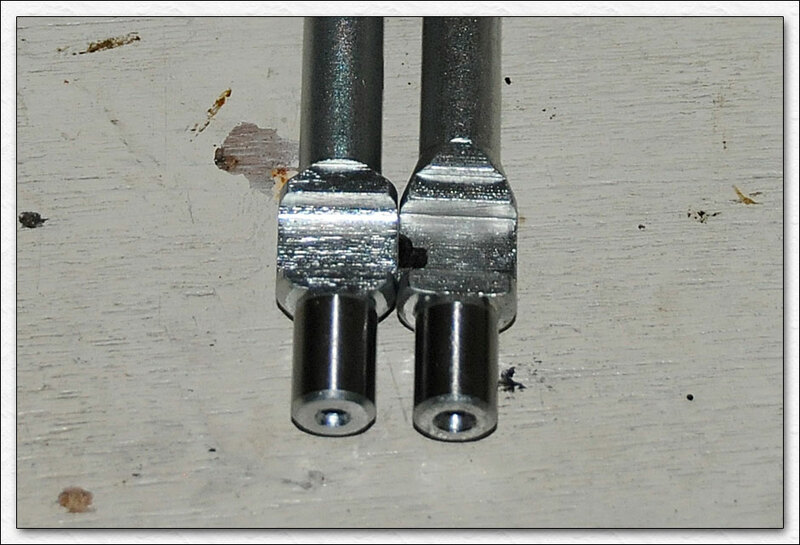 #14 Clutch Push Rod Cam (replaced because of excessive wear in the area that meets the number 12 clutch push rod. New one is slightly different). #17 Thrust bearing (replaced because the needle bearings appeared worn). #18 Oil Seal (replaced just to be safe). You may want to order a clutch cover gasket, but after tearing mine down nine times and re-assembling, still no leaks from the original. Looks like QingQi is using very good quality gaskets at the factory. Let's get inside and take a look. First thing you need to do is drain your oil. Then back off your rear brake adjuster so you can push the foot lever far enough down to access the screws and pull the cover. 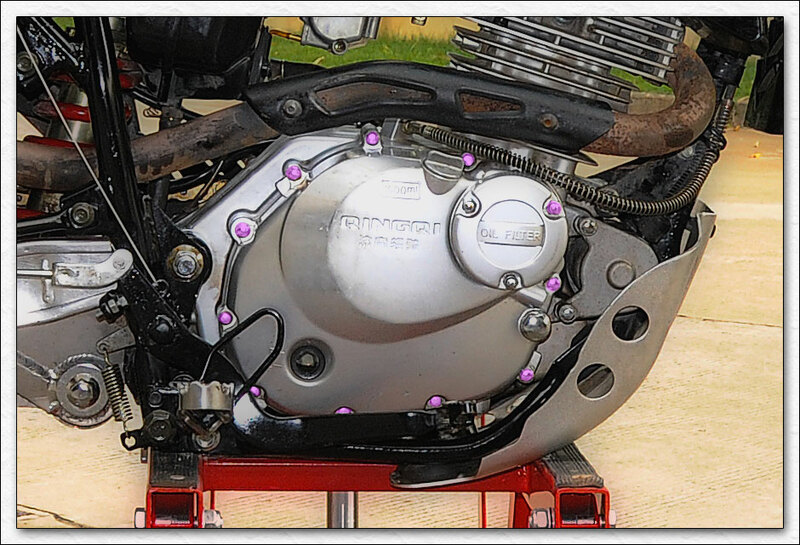 Remove all the screws (highlighted in purple) with an 8mm socket. Don't forget the one on the oil filter cover. Gently pull the cover (oil will spill all over your floor). You may have to give it a tap with a rubber hammer to break the seal with the gasket. With any luck, the gasket will stay in one piece. Here is the inside. Notice the 14mm wrench I wedged in (bottom left) to keep the brake lever down and out of the way. Let's remove the clutch springs and the pressure plate. Now you can get at the individual clutch plates and the clutch push rod. If you're just replacing springs and plates, do your thing and button her back up. I replaced the cluch push rod, the new one was 2mm longer. The whole clutch removed, see the scoring on that washer. Maybe not necessary to replace, but I felt better doing it. The clutch push rod is still inserted, you need to pull it out before going to the next step. The clutch push rod cam is probably the main cause of my problem. 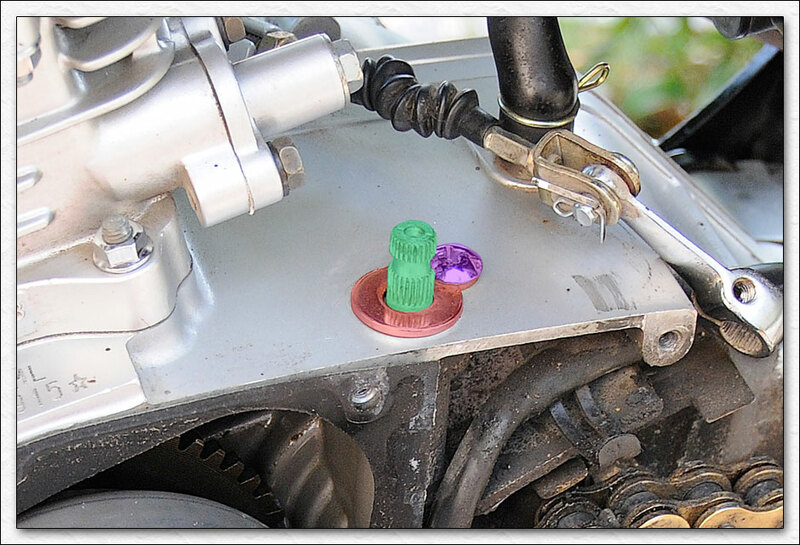 To get it out, remove the screw (purple) and washer (red), now pull the cam (green) out with a good set of pliers. The seal will come out with the cam. My cam doesn't look so good , time for a new one. Hmmm.. the new one (left) is slightly different. Maybe improved? Now put it back together, replace the oil and fire it up. Shifts like a dream again. This set me thinking about a mod I read about in a South American forum. The poster said that the release arm (item 21 in the drawing) seemed to be floppy and lifeless, same for the handlebar lever, rather than return to their rest positions positively. He didn't like that and cured it by fitting a suitable compression spring under or instead of the rubber bellows of the clutch cable as it attaches to this arm, between the clutch cable anchorage and the clutch arm. He could be right, the wear on the cam shown on your photo could be due to the release mechanism being in constant contact with the cam, rather than have a small clearance while running. Other bikes have a helical spring on the outside or inside of the casing to ensure this release arm returns to its rest stop. My humble SKYTEAM ST110-6 for instance, has a spring on the outside wrapped around the shaft under the arm. As the obtaining and fitting of that type of spring is not easy we'll have to use a simple compression spring. Such a spring cannot simply be inserted on the cable as the "U" of the clevis pin that fixes it to the arm is permanently attached to the cable. You'll have to "thread" the spring on to the cable coil by coil. No great problem. This failure is similar to what's called "riding the clutch" by people that keep their foot riding lightly on the clutch pedal. This causes much premature wear on car clutches by forcing the release bearing to work constantly. In addition he said that the clutch action felt much better, with the handlebar lever returning better to the rest position, etc. I'm going to do that mod. What do others think?. Last edited by forchetto; 10-24-2008 at 11:23 AM. Another first class post by ChinaV! Excellent detective work and I'm glad you got it sorted out. Sweet pics, even got the images on a paper textured background with a little bit of drop shadow. Killer. How about a few comments on how yo make the individual components glow? Forsch, sounds like adding a return spring to the clutch cable couldn't hurt but do you think your lever action is too loose or sloppy? I've got the cable slack correctly set, the cable inner has been oiled and everything, but the handlebar lever doesn't really return to its initial rest position properly. I'm always flicking it back the last couple of mm with my hand to make it rest properly. After reading the post about it I did see that the engine side release lever could be manually moved without any inherent spring pressure, by a small amount and did consider adding the spring but thought the usual "manufacturer knows best", etc. 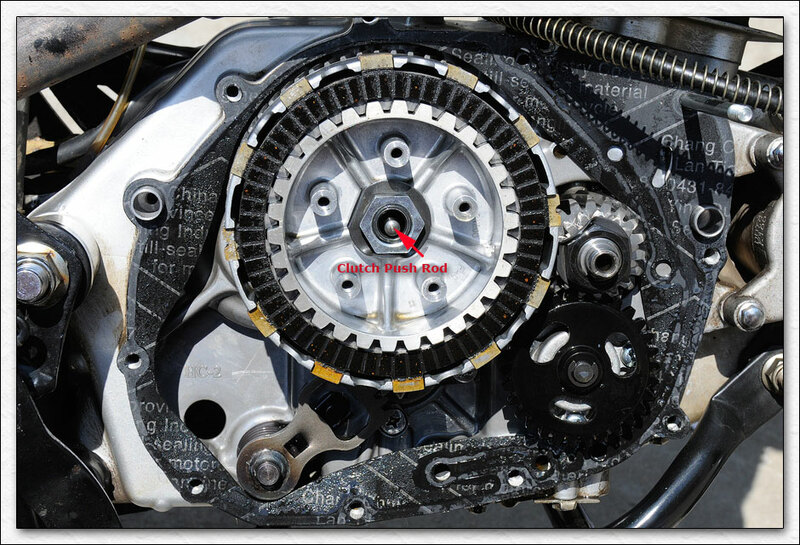 There is an important bit of an adjustments within the clutch case, right in the centre of the clutch drum, that sets the proper clearance of the release mechanism and push rod. If you've ever seen a Honda C50 Cub, the ones with an automatic clutch, you'll recognise it. It takes the form of a screw and lock nut (items 19 and 20 on drawing and well visible on the second photo), that on the Honda is (wisely) externally accessible for adjustment purposes. It was the same on the popular CB350. Honda always ensure this adjuster is externally accessible. 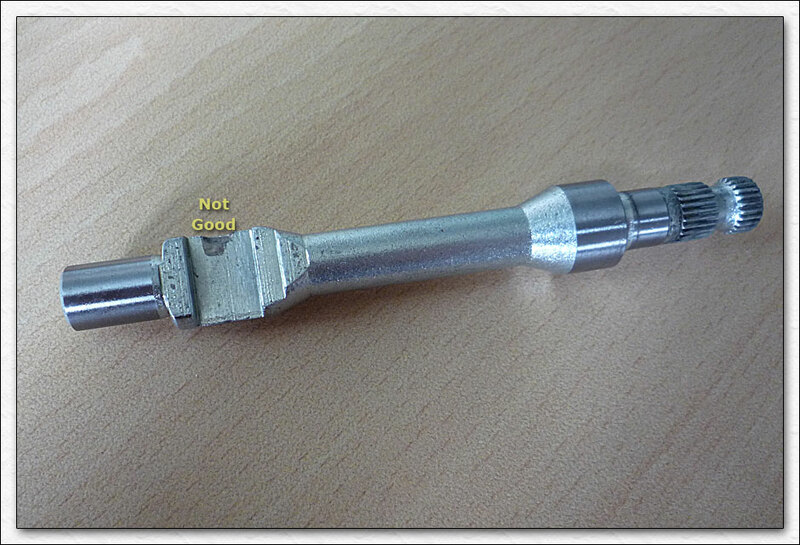 Failure to set this item can force the pushrod, etc to be rotating continually accelerating wear. Could that have been the reason the old pushrod was 2 mm shorter? or could a longer pushrod remove the "slack" present in my mechanism?. 2/Turn in (clockwise) the adjustment screw until resistance is felt without forcing. 4/ Tighten lock nut while holding screw steady. This gives the pushrod mechanism a running clearance of 1/4 of the screw thread pitch. If the adjuster screw is M8 size this would be about 0.31 mm or so. A clue to ascertain if the pushrod had been rotating continuously would be a discoloration of the ends due to overheating, probably a bluish or yellowish colour. Last edited by forchetto; 10-24-2008 at 08:11 PM. Enjoy a last pic of this nice little bike carefully maintained by ChinaV. Under the patronage of CrazyCarl and ChinaV, she has already seen in her short life more unchartered territories than many bigger ones. I've heard that ChinaV gave it as a charity to a village idiot who will certainly wreck it in a matter of weeks... Some people should be forbidden to ride. Got down to the garage today with the intention to fit the return spring mentioned earlier and what do I find?, the scheming, good for nothing varmint had cured it herself!...no slack was apparent and the lever-cable returns to its rest position eagerly. Perhaps the system needed running-in and bedding or perhaps the bike did it herself just to make me look a fool. A Chinese bike that fixed itself!?!? Thats right. What's more she first let me rummage for ages in my spares boxes for a suitable spring, and having found some, I approached her with a handfull of tools and a manic grin on my face and then...I noticed that everything was OK. I do remember the last thing I did was to tidy up the control cables and wiring on the handlebars and maybe the clutch cable was trapped somewhere, holding the mechanism and preventing it from returning fully. I had been wondering about that clutch cable and where it runs, like underneath the exhaust downpipe, resting on the clutch side of the engine, (mine has worn a patch through the black paint there). Now I take it everyone lubes their cables, grease, oil, whatever, but where that cable runs under the downpipe, I was wondering if heat from that downpipe could be drying out the lubricant in the cable housing, resulting in the cable sticking slightly in it's outer shroud. I suppose on the move the airflow might prevent heat getting to the cable, but what about when the bike is stationary, or slow moving in traffic, could the heat cause a problem. If the downpipe/header heat is a problem, a solution might be shielding, or sourcing a lubricant that can handle heat. 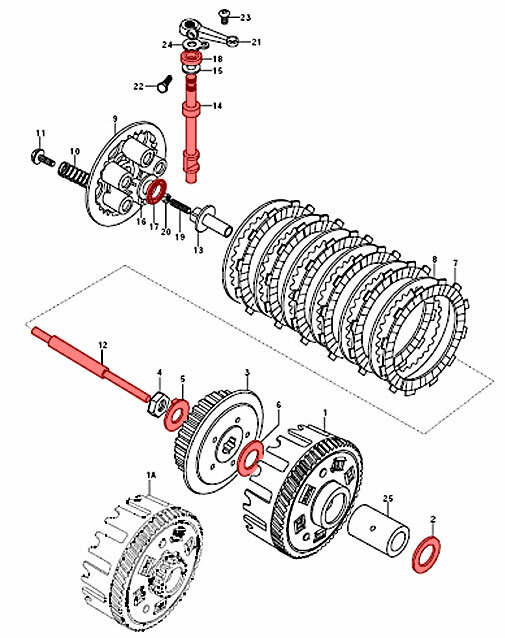 Looking at that worn/damaged clutch shaft, could that damage have occurred by a sticking clutch cable, just holding the clutch rod slightly in contact with the moving parts, but not requiring any force to do anything, something akin to the term 'riding the clutch'. A dry cable from experience, will slow return action of a controlling part. Also from the above post, by Forchetto, tidying Bowden cables, can drastically alter their action, too much slack and the force applied can be wasted on the cable outer flexing and too tight as in tidying them out of the way, can result in sticky action requiring more force to shift. Somewhere in a bowden cable's placement, there is a method, where the stickiness and flex are about equal, thus becoming more or less neutral. Designers of machines take into consideration the advantages and disadvantages of these cables when they design a machine and care is taken in their routing and placement. I am just wondering if there is a formula for bowden cables for working out lengths and radiuses encountered, there must be given the problems these things can throw up. The coiled wrap around the cable is supposed to help with heat, but I agree with your theory that a sticky cable isn't doing the clutch shaft any favors. I've never been impressed with the design as all the QM200/QM250 bikes I have ridden seem to be a bit clunky and often have difficulty hitting neutral. I use a teflon based cable lube since it doesn't collect dirt and seems to have good heat resistance.